Fancy an Amazon Echo, but love brick-and-mortar bookshops too much to entertain putting another couple of notes in Jeff Bezos' pockets? The Lenovo Smart Assistant, making its debut at CES 2017, may be what you're after. Why? Because it's basically an Amazon Echo clone, minus the Amazon branding. 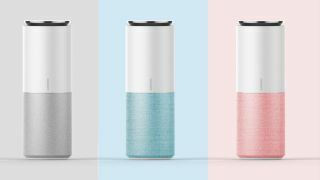 The Chinese manufacturer, best known for its laptops and smartphones, is looking to break into the home tech area at this year's CES with its own voice-activated cylindrical speaker, powered by Amazon's own Alexa assistant technology. There's really not much to separate Lenovo's offering from Amazon's, with the key differences being interchangeable color options (a bit like Google Home, somewhat ironically), and the option of a premium Harmon Kardon audio equipped version. That should up the volume output and general speaker clarity – although hopefully the microphones are of an equally high standard, or all the smart features are rendered a bit moot. Eight 360-degree far field mics are built in, which could give the Lenovo the edge over the seven found in an Echo. Other than that, it's Echo-like business as usual, with the speaker responding to voice commands, letting you access music streaming services, news reports, reminders and your Amazon shopping list, along with all manner of home automation options providing you have other internet of things items installed. The base model, minus the Harmon Kardon audio chops, undercuts the Echo a little at a US price of $130, while the premium version sits at $170. International pricing is yet to be revealed, but a straight conversion puts the pair at AU$180/£105 and AU$235/£138 respectively. The big winner here of course is Amazon – licensing out Alexa to its biggest third-party partner yet, it's proving that its voice assistant is a true platform in its own right, not just merely a product line.